The only movie powered by AC/DC. This legendary concert film, covering a 1979 Paris concert during the Australian heavy metal band's "Highway To Hell" tour showcases the power and precision that the quintet bring to vicious rockers like "Whole Lotta Rosie" and "Let There Be Rock." Pixieish lead guitarist Angus Young, attired in his trademark school-boy's uniform, takes center stage with his energetic antics and frenetic solos, while the rest of the band crank out their minimalist boogie with quiet determination. 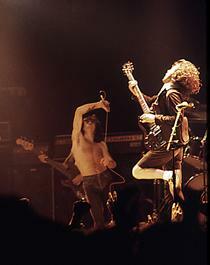 Interview segments and humorous backstage footage show another side to the thuggish musicians, especially AC/DC's flamboyant lead singer Bon Scott, who died two months after this filmed concert. AC/DC: The Bedrock of Riff. With their powerful riffs, steady rhythms, easy going sense of humor, and above all, pure, electrifying, deafening volume, rock band AC/DC has endured through decades of changing trends and shifting fads. 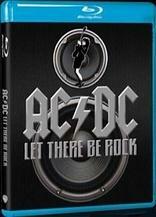 Shot in December of 1979, 'AC/DC: Let There Be Rock' is a live concert film that features the band at the brink of stardom. Playing through several of their most admired tracks at the time, the movie is a great demonstration of their deceptively simple style and pulsating stage presence. 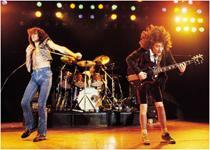 Comprised of bassist Cliff Williams, drummer Phil Rudd, rhythm guitarist Malcolm Young, lead guitarist Angus Young, and lead vocalist Bon Scott (who sadly passed away only two months after this show was filmed), AC/DC is a classic hard rock band in the truest sense. Though I'm not exactly a huge fan, I do admire their work, and seeing their live performance here certainly increased my appreciation for the band's particular brand of head thumping sonic mayhem. The film starts off with a fairly loose, no frills, and slightly experimental look at preparations for the big show, before eventually segueing into the actual music. Informal interviews with the band are inter-cut between stage performances throughout and one segment essentially features a music video showing the members flying planes and driving cars. While the interviews themselves do offer some minor insights and it's nice to see the musicians playfully talk about each other, most of this material is pretty uninteresting. Thankfully, the filmmakers realize that the real focus should be on the concert itself, and the vast majority of the movie showcases the band doing what it does best. The actual concert is pretty good and features some great performances of tracks like "Highway to Hell", "The Jack", and the title anthem itself "Let There Be Rock". The filmmakers present the footage in a fairly straight forward but still kinetic manner, cutting between various angles and vantage points to immerse the audience in the exciting production. Some slow motion is also used quite effectively in certain sequences to add a little bit of visual flair. While the music is definitely good, what really makes the concert special are the fantastic stage presences of Bon Scott and Angus Young. Scott commands the crowd with his distinctive vocals and breathes real power into each line he belts. 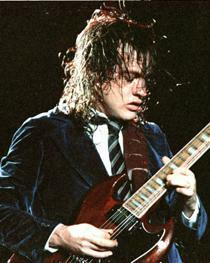 Angus Young on the other hand, is something else entirely. Marching around the stage in a school boy uniform while he convulses like a mad man, Young is a monster of charisma and energy. At one point he starts to do a hilariously tongue in cheek striptease, and through his antics, he expertly plays the crowd like the very strings on his guitar. His solos are also real highlights, and watching him literally put everything he has into every chord and riff is quite amazing. Near the end, he even needs to momentarily step off stage for some oxygen and water. Of course when he returns he pulls off his most impressive stunt by soaring through the audience on the shoulders of a brave roadie all while effortlessly strumming along. The band is talented and the music is strong, but at its core 'AC/DC: Let There Be Rock' is a pretty standard concert film. There aren't any real standout cinematic touches, and the breaks from the actual music aren't terribly interesting, though the performances themselves certainly are great. Really, one's enjoyment of this movie is going to come down to whether or not you're a fan of the band. If you are, this is a great look at them in action, one that's well worth your time, and if you're not, well this probably won't change your mind. Warner Bros. has put together a pretty cool package for this 30th Anniversary limited edition set. All of the contents come in a collectable tin case with a numbered sticker on the bottom (though being 04477 out of 90000 doesn't exactly make me feel special). Included in the set is the film itself housed in a standard Blu-ray case along with a DVD copy. Rounding out the package is a thirty two page booklet with liner-notes by Anthony Bozza, a souvenir guitar pick (now I just need to get an actual guitar… and also learn how to play), and ten collector cards featuring photos of scenes from the movie. All in all, this is a pretty nice if not overwhelming set, though like many similar packages, the tin case won't exactly fit snugly on your shelf. The movie is provided with a 1080p/AVC-MPEG-4 transfer in the 1.33:1 aspect ratio. Unfortunately, this looks pretty bad. The print itself is in OK shape though there are signs of age and frequent hairs visible on screen. Grain is present but its appearance is a bit strange. Though sometimes heavy, it has a slightly unnatural and static look. There is also a sort of sparkling quality found on whites during some of the interview footage. Without knowing the exact details of how this movie was shot or in what condition its original elements were in, it's hard to come to a firm conclusion, but there are certain negative aspects to the picture that may be indicative of DNR or other unnecessary digital manipulation. Fine detail is essentially nonexistent, and what we basically get is a muddy, hazy, often times fuzzy image that holds no depth. Colors are decent though, and do an OK job of showing off the lighting design of the show. Contrast is fine but black levels are a hair elevated during certain sequences and slightly crushed in others. I understand that there are probably pretty big limits on how good this film can look, but there just seems to be something off about the presentation and supposed remastering done here. Ultimately, regardless of whether or not the lackluster video is simply the fault of the original elements, or an incredibly poor transfer, the end result is just not pleasing. Still, the strength of the music itself shines through. Originally recorded in stereo, the 5.1 remix does little to open up the soundstage. Surround use is present, but very faint, with only some soft crowd reactions and echoes of music cues being sent to the rears, rarely adding much immersion. Separation between elements is also pretty indistinct. There's even some very minor crackling during the band's performance of "Highway to Hell". Thankfully, despite these issues, I do want to stress that the music still sounds good and brings some nice but not terribly varied dynamic range. Bass is strong but not on par with newer releases. The audio seems to be a victim of the movie's modest source elements but still packs a punch and delivers the music in a perfectly acceptable but not always impressive manner. The inclusion of the original stereo track is nice, though it would have been better if it was lossless as well. Warner Bros. has included eleven featurettes in 1080i with Dolby Digital stereo sound and the same assortment of subtitle options as the main film. The featurettes are available to view separately or together and all include the same group of participants discussing various aspects of the band. Those interviewed include several music journalists and members from the likes of The Smashing Pumpkins, Anthrax, The Donnas, and Def Leopard. The featurettes are all done in the same style and offer a decent assortment of information, but the talking head approach and lack of actual footage of the band is disappointing. Fans will still find some value here though. Loud, Locked & Loaded: The Rites of Rock (HD, 9 min) - The participants discuss their beliefs on rock and how AC/DC epitomizes those attributes, focusing on their sometimes controversial image. They also touch upon the band's knack for creating an exciting atmosphere during shows. AC/DC: The Bedrock of Riff (HD, 11 min) - Guitar riffs are now the focus and the participants describe the band's unique talent in this regard. The musical chemistry of the Young brothers is also touched upon and special note is made of Malcolm Young and Phil Rudd's understated importance to the band. Angus Young: A True Guitar Monster (HD, 12 min) - The participants analyze Angus Young's infectious and unique stage presence as well as his seemingly unlimited supply of energy. Bon Scott: The Pirate of Rock 'n' Roll (HD, 12 min) - The late Bon Scott is discussed. Topics include his distinct vocals, his infamous partying, his great love of women, and his honest lyrics. Some details on his unfortunate death are also delved into. AC/DC: A Rock Solid Legacy (HD, 24 min) - For this featurette the interviewees go through the history of AC/DC and discuss their lasting impression. The band's gradual rise to fame, shifting styles, and transition to Brian Johnson are covered in detail, but again, there is unfortunately no actual footage of the musicians themselves. Bad Boy Boogie Pod (HD, 5 min) - In the first of six in depth looks at specific songs, Angus Young's signature track is the topic. The participants all provide some fairly entertaining commentary on Young's striptease antics, though apparently Anthrax's Scott Ian isn't a fan. The Jack Pod (HD, 5 min) - The comical origins of "The Jack" are described, which not so surprisingly is actually about an STD. Highway to Hell (HD, 3 min) - "Highway to Hell" is analyzed, focusing on its origins as an expression of life on tour as well as its controversial elements. Whole Lotta Rosie Pod (HD, 5 min) - Another comical song origin is discussed as the identity of Rosie is revealed. Rocker Pod (HD, 4 min) - More of Angus's antics are touched upon, discussing his potentially dangerous habit of performing in the crowd during this track. Let There Be Rock Pod (HD, 7 min) - In the final featurette the interviewees turn their attention to the band's famous, almost biblical anthem and discuss what makes it so great. 'AC/DC: Let There Be Rock' is a good showcase of this influential band's pulse pounding music and exciting stage presence. The video presentation is weak, but the audio is solid if not quite impressive. Supplements are decent but a little unengaging, though the limited edition packaging is a nice touch. Despite some of the technical faults, fans of the band will still find a lot to like here.